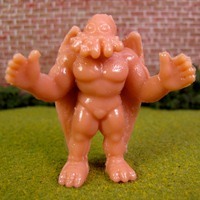 The Cthulhu figure has an interesting backstory. The figure was created as a single custom figure by Phil Staszkiw for his own personal enjoyment. It sat, one-of-one, on his shelf for many years. Then Eric Nilla and Phil connected which led to a small run of figures. The figure looks to mainly be build on the body of a #187 M.U.S.C.L.E. figure. It appears as if much of the original detail of the #187 has been eliminated. The head features the most noticeable changes. The long, octopus-like, tentacles of the Cthlhu head have been added. The Cthlhu often features wings which are a natural part of the #187 figure. As always, Eric’s casting is clean, with a flesh-like color (although many different colors were available), and a very pleasing, rubbery, kinkesi-like feel. I have to admit. I totally forgot how I got this figure. Maybe I bought it? But my gut says he was an extra with another order – because I don’t have the packaging. But maybe it never had any? Only upon close inspection would a collector notice how much the #187 has changed. A casual glance would suggest the figure is a pretty simple “head swap.” (I know it’s not technically a swap, but I’m sure you understand.) A close inspection of the face really reveals a perfect Cthlhu head for the figure. If the tentacles had been too long it probably would have given the figure more of a bearded look. A “head swap” type of custom tends to be a high risk/high reward situation. This figure is an example of the high reward. Sadly this figure is no longer for sale in Eric’s store. However, if the demand was there, I’m sure Eric would make these figures available. This entry was posted on Thursday, February 27th, 2014 and is filed under Art, UofM News. You can follow any responses to this entry through RSS 2.0. You can skip to the end and leave a response. Pinging is currently not allowed.